Pitel added a comment to D11071: [RFC] [Active Window Control] Allow global menu be left alligned with buttons on right. @martinkostolny I will try to give it some testing this week. Pitel added a comment to D11746: Assign notification area category. Pitel committed R120:bd5619e0155a: [Media controller] Add simple volume control (authored by Pitel). Pitel closed D11021: [Media controller] Add simple volume control. This one I don't fully understand. Why show on: mouse_out|mouse_in for all items is not enough to satisfy all scenarios? Pitel added a comment to D11843: Show the scrollbar only when needed. I know the stripe is still useless but user sees "it is disabled scrollbar, ok", not "empty black stripe, what is going on". How does it work if text fills the whole line (or if you run mc or some other ncurses application)? Does it wrap the text once scrollbar is shown, hide it or is the text always wrapped in front of scrollbar's rect even if the scrollbar is not visible? Pitel added a watcher for Plasma: Pitel. Pitel added a watcher for KDE Connect: Pitel. Pitel updated the diff for D11410: [RFC] Add option to make applet fixed width. Pitel added inline comments to D11410: [RFC] Add option to make applet fixed width. Pitel updated the diff for D11021: [Media controller] Add simple volume control. Convert changeVolume helper into a Job... Right now it does not check wheter the DBus call is successful - I tried to wire it in but ended with segfault. I will investigate it further. 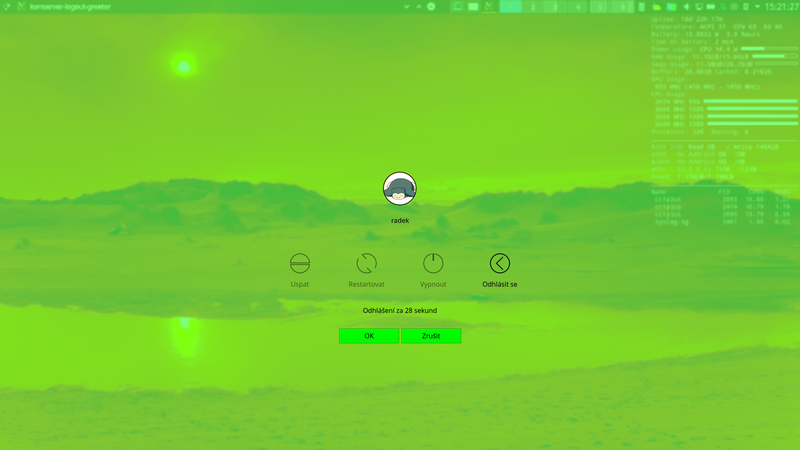 Except that I hope it is ok.
Pitel added a comment to D11262: KDE logout screen background color fix. Pitel committed R120:ba749fad105a: Merge branch 'Plasma/5.12' (authored by Pitel). Pitel committed R120:fc0033ede6b0: KDE logout screen background color fix (authored by Pitel). Pitel committed R120:af2a74341d5f: KDE logout screen background color fix (authored by Pitel). Pitel closed D11262: KDE logout screen background color fix. Pitel updated the diff for D11352: [RFC] Auto ordered systray. Pitel added inline comments to D11352: [RFC] Auto ordered systray. Pitel committed R884:f48d5afac734: Show window title when app name is missing (authored by Pitel). Pitel closed D11072: [Active Window Control] Show window title when app name is missing. Pitel committed R884:1119c47f1756: [Active Window Control] Slightly fix vertical alignment of window name (authored by Pitel). Pitel closed D11065: [Active Window Control] Slightly fix vertical alignment of window name. Add support for panel spacer -- currently we just check whether the applet is panel spacer and if it is we use applet.configuration.expanding instead of our fixedSizeOverride. I think we should remove context action to set expanding from panel spacer after this is landed and then convert it to use fixedSizeOverride array. Pitel added a comment to D11352: [RFC] Auto ordered systray. Pitel abandoned D11292: [RFC] Ordered system tray v2. Great, but I found one more bug (and it affected order of items). This fixes it. I am using Czech translation and I am satisfied with item order (but I keep only a few items in my systray). I like the current rule because it is simple and have some internal logic (even though it might not be obvious what the text of an applet is) and it is not just a fixed random order. I would rather not implement some crazy compare function just because it has somewhat reasonable results. Pitel added inline comments to D11021: [Media controller] Add simple volume control. Pitel added reviewers for D11352: [RFC] Auto ordered systray: VDG, Plasma. Pitel added a comment to D11021: [Media controller] Add simple volume control. it's moving on the right track.. i would like the checkbox to appear like the one in the panel spacer, in the context menu could be tricky as would need to inject into the applet's contextualactons, so let's forget about it for now. I'm not sure that is good idea: There are already some items injected in context menus (e.g. Unlock widgets action) and looking at my panel some applets' context menus are not injected. I believe it is because they have multiple menus bound to specific parts of itself and only applet's global menu is (and can) be injected. Most notable examples are systray except the expansion arrow and task icon manager except empty space (if it has set fixedWidth I was unable to find a place in it which would show me context menu containing Unlock widget action). Pitel added a reviewer for D11410: [RFC] Add option to make applet fixed width: Plasma. Pitel added a comment to D11410: [RFC] Add option to make applet fixed width. no shrinking: minimumWidth = preferredWidth? Pitel abandoned D10944: [taskmanager applet] Do not fill width. Pitel requested review of D11410: [RFC] Add option to make applet fixed width. Pitel planned changes to D11352: [RFC] Auto ordered systray. I guess Phabricator does not let me only respond to inline comments. Doesn't seem to work for me. Only Notifications item is visible by default while there are multiple items set to be shown in the configuration. Also, changing the visibility state doesn't make any difference and the items are neither in panel nor in hidden panel, they just disappear. Only after going through configuration and manually switching every item to hidden and then to shown makes most of them visible. Pitel added a comment to D11292: [RFC] Ordered system tray v2. To compare with auto ordering (as @mart would like) see D11352. Pitel requested review of D11352: [RFC] Auto ordered systray. Pitel added a comment to D11072: [Active Window Control] Show window title when app name is missing. I do not have write access. Pitel added a comment to D10837: bad textarea width for rename file if filename too short. @painlessroaster is not me. What gave you impression he is? Pitel added a comment to D11308: Use the default Plasma wallpaper on the lock screen. Pitel added a comment to D10944: [taskmanager applet] Do not fill width. Ahh sorry I misunderstood you. Moving this option to containment level seems reasonable although I'm not sure for how many other applets it might be useful -- except taskbar and Active Windows Control (the global menu applet in my screen shot and it already has this option) all applets I use are fixed width. Pitel updated the diff for D11292: [RFC] Ordered system tray v2. Ping. The current version adds a configuration option fillWidth (enabled by default) which allows the applet to grow beyond its preferred size. I tested it in usual setup and with fillWidth enabled the behavior is unchanged. FWIW, the crash you're referring to is also fixed with an up-to-date (not released yet) Qt. I am aware of getFixedItemId, only forgot to mention it in summary. Right now it is not included mostly because it is another hack (but fixing stupid behavior of someone else so unavoidable) and I do not use DropBox, but if this gets any closer to landing, we should reintroduce it. Pitel updated the summary of D11292: [RFC] Ordered system tray v2. Pitel added a comment to D11233: Ordered system tray. I really like the idea of being able to reorder the systray as I wish. I could not resist and took my stab on the issue (with drag&drop) D11292. Pitel requested review of D11292: [RFC] Ordered system tray v2. Do I need to do anything to make it land? Pitel added a comment to D7537: KDE logout screen - change black icons & texts to white/greyish. I finally found what was wrong here: the background should not be black when button background color is light but the calculation introduced by D5036 is wrong. My attempt to fix it is D11262. 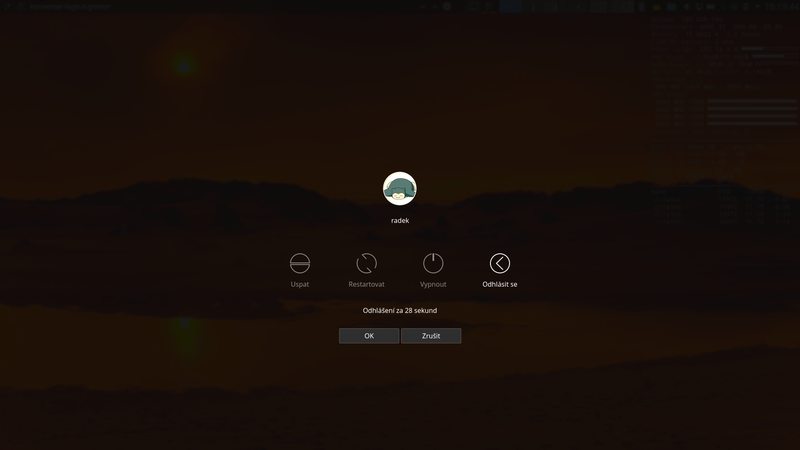 Pitel requested review of D11262: KDE logout screen background color fix. I guess I am not that confused anymore -- with normal color group the color of text (outside of buttons) is determined by text color theme setting but with complementary group by button text color. I have the same problem in 5.12.2 release. I think the root of it is assuming that foreground in PlasmaCore.Theme.ComplementaryColorGroup is white(ish) and background is dark (this is true only if normal color scheme uses dark text on light background, which is default) and forcing that background is really dark (since D5036). My personal hack is just to replace ComplementaryColorGroup with NormalColorGroup (which obviously breaks default setup). A bit less of a hack would be choosing either NormalColorGroup or ComplementaryColorGroup depending on which one has darker background. Pitel updated the diff for D11065: [Active Window Control] Slightly fix vertical alignment of window name. Moving appmenu instead of window title. Pitel requested review of D11073: [RFC] [Active Window Control] Elide appmenu when it is too long. Pitel requested review of D11072: [Active Window Control] Show window title when app name is missing. Pitel requested review of D11071: [RFC] [Active Window Control] Allow global menu be left alligned with buttons on right. Pitel added a comment to D11065: [Active Window Control] Slightly fix vertical alignment of window name. Would it be better to move global menu 1px down instead? Pitel requested review of D11065: [Active Window Control] Slightly fix vertical alignment of window name. The changeVolume helper must be in PlayerControl class and MultiplexedService must only forward calls to it in order to volume change by mouse wheel also work for other sources than only mutliplex one. Pitel updated the summary of D11021: [Media controller] Add simple volume control. Pitel added a reviewer for D11021: [Media controller] Add simple volume control: broulik. Volume is bounded at max(oldVolume, 1.0). Refactored osd & volume bounding logic into helper MultiplexedService::changeVolume. Pitel retitled D11021: [Media controller] Add simple volume control from [Media contoller] Add simple volume control to [Media controller] Add simple volume control. Pitel requested review of D11021: [Media controller] Add simple volume control. Pitel updated the diff for D10944: [taskmanager applet] Do not fill width. In previous revisions I used fillWidth = false but it is wrong because it not only prevents expanding but also it prevents applet from shrinking. So use Layout.maximumWidth = Layout.preferredWidth instead. Also after further testing I do not think the option must be restricted to icon version of applet only -- with full version (and Spacer applet) it allows you to align task on right side of panel which was impossible before. Screenshots with Global Menu applet (panel contains Global menu, growing Spacer and icon taskmanager). Not really -- if I understand correctly allocating space works following way: All widgets get space they claim they need and the surplus is split among widgets with fillWidth == true in ratio which seems proportinal to width of given widgets. So even if global menu took space needed to display all menu items there still would be an ugly gap on right side of taskmanager. Pitel updated the summary of D10944: [taskmanager applet] Do not fill width. Pitel requested review of D10944: [taskmanager applet] Do not fill width.